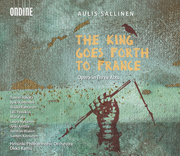 The Finnish Broadcasting Company YLE has chosen the première recording of Finnish composer Aulis Sallinen's opera The King Goes Forth to France (1983) as 'Recording of the Year 2006'. Okku Kamu, who conducted the world première performance at the Savonlinna Opera Festival in 1984, leads a prestigious Finnish cast - including the Cardiff-winner Tommi Hakala (baritone; King), Jyrki Korhonen (bass; Prime Minister), Riikka Rantanen (soprano; The Nice Caroline), Lilli Paasikivi (mezzo-soprano; The Caroline with the Thick Mane) and Jyrki Anttila (tenor; Guide). Also featured are the Finnish Philharmonic Chorus and the Tapiola Chamber Choir (ODE 1066-2D). The award winning CD was selected among 91 entries produced in Finland or presenting Finnish creative or interpretative art music. The award jury commented: "The première recording of this opera is a project undertaken with passion and accuracy. (...) The featured soloists represent the top level of Finnish singers. The choral and orchestral performances will satisfy even the most demanding listeners. The elegant and expertly edited booklet includes the libretto in English and completes the impression of a highly successful product." YLE assigns the 'Recording of the Year' award annually to a record company and performers that have significantly promoted and advanced Finnish music. In the 36 years of the award's history, Ondine has been its recipient 12 times in total. Gramophone Magazine featured the disc as the 'Editor's Choice' in July 2006. Guy Rickards describes the opera as Sallinen's "best and most profound, and its impact on Sallinen's subsequent music is incalculable. (...) The King Goes Forth is a bitingly satirical musical allegory. (...) Brillantly scored, the orchestral contribution is crucial, underpinning the foreground action (...) and the word-setting and dramaturgy have the effectiveness of Britten or Henze. The cast is uniformly good (...). Ondine's spectacular sound catches both the quietest ruminations of the four women and the explosive eruptions of the King's great cannon, Parliament. Highly recommended." The recording was the BBC Music Magazine's 'Opera Choice' in June 2006. John Allison praises the disc as "aptly described as 'a fairy tale for the grown ups' (that) has lost nothing of its resonance: the protagonist starts out as an idealist and ends up as a power-crazed, warmongering tyrant. The music, some of Sallinen's strongest, still stands up extremely well (...). The opera shows Sallinen's innate theatricality. Kamu, who conducted the premiere, takes authoritative charge." The Opera magazine selected the recording as 'Disc of the Month' in its June 2006 issue. The King Goes Forth to France (libretto: Paavo Haavikko, based on his radio play of the same name) is an allegorical drama stretching over three acts, comprising a prologue and thirteen scenes. The relatively large company of character roles is led by a narrator who slips in and out of the part of scribe and chronicler, which is also a spoken role. The subtitle given to The King is not 'an opera' but rather 'a music-theatrical chronicle from the time of some future ice-age'. Aulis Sallinen (b. 1935) now commands a place in the forefront of Finnish composition and he is internationally regarded as one of the foremost living opera composers. He has written six large-scale operas: The Horseman (1974), The Red Line (1978), The King Goes Forth To France (1983), Kullervo (1986), The Palace (1991-93). In 1999, he composed his sixth opera, King Lear, with a libretto adapted from Shakespeare's play.